What Does Code P0264 Mean? Fuel injectors have taken the place of carburetors in modern automobiles. Carburetors tend to be difficult to adjust. They cannot deliver the same fuel mixture to each cylinder in a car’s engine, because each cylinder is located different distance from the carburetor. Twin-carburetors represented an improvement, but they are still hard to keep tuned. Fuel injectors deliver the fuel air mixture in precise bursts. They act like the nozzle of a hose whose flow is controlled by a spring, injecting the fuel into the cylinder as a fine mist. All the cylinders can be served by a single injector, or each by its own injector. 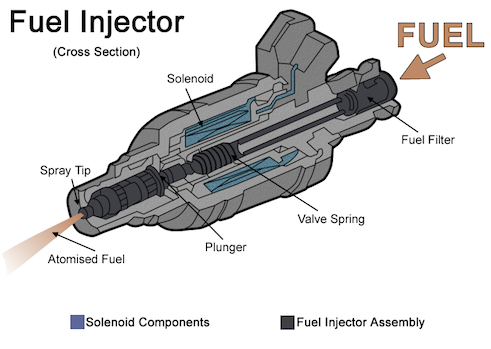 A common type fuel injector is a pulsed type, in which times the bursts to coincide with the piston’s stroke. In modern cars and truck, electronics controls the timing; actuating an electromagnet that controls a spring’s action inside the injector body to open and close the outlet. P0264 tells you where the problem is believed to be located, and what the problem appears to be. In this case, the code tells you it is a powertrain issue, that either the fuel mixture for the #2 cylinder is out of range or the fuel injector’s spray pattern is abnormal, or both. What are the common causes of code P0264 ? Most often, the cause of the problem can be traced to the #2 cylinder fuel injector itself, or in the electrical circuitry associated with it. A dirty or plugged fuel injector, or a faulty fuel injector, are common causes, although somewhat surprisingly, an electrical malfunction of one type or another is more likely to be the source of the problem. Electrical malfunctions can consist of either an open circuit or a coil-to-coil short in the fuel injector harness, a loose or corroded connector to the fuel injector control module (FICM), or a fault in the FICM itself. A faulty oxygen sensor is another, although somewhat remote, possibility as would be a fault in the PCM. The wiring harness to the PCM is rarely a source of the problem, which is a good thing since this harness can be hard to gain access to on most vehicles. What are the symptoms of code P0264 ? The Check Engine Light was illuminated because the vehicle’s powertrain control module (PCM) detected a drop in voltage in the fuel injection sensor in the #2 cylinder. It is in the PCM where OBD codes are generated when one or more of the sensors it monitors malfunctions, or gives an out-of-range reading. A P0264 code will be generated when a low fuel injection sensor voltage for the #2 cylinder is detected. This sensor is an oxygen sensor, and the low voltage is often an indication that the injector’s spray pattern has changed and the #2 cylinder’s fuel mixture is too lean. The symptoms arising from too lean of a fuel mixture can vary in their characteristics as well as in their intensity. What typically happens, is that when the PCM senses the fuel mixture is too lean, it enriches the fuel mixture. Unfortunately, it does so in all cylinders; not just the #2 cylinder. One of the more prominent symptoms is engine knock. The lean mixture in the #1 cylinder creates a higher cylinder head temperature. This higher temperature causes premature denotation of the fuel-air vapor mixture, which in turn causes knocking. This in turn can active the knock sensor, causing the PCM to retard the timing, which in turn causes the engine to run rough. When the timing is retarded, the vehicle will begin to lack power, most notably so when accelerating. Another symptom is an immediate, and often significant, reduction in fuel economy. Since a problem of this type often has a ripple effect, other symptoms of other problems will at times make their presence known. They may however seem to bear little relationship to the fuel injector problem. Fixing the fuel injector problem may or may not resolve issues created by the ripple effect. How do you troubleshoot code P0264 ? Once the P0264 code has been detected, the first step to take is to try to determine whether the problem is with the fuel injector itself, or with its associated electrical connectors and wiring. The electrical connector, and the harness, should be inspected first to see if anything has become loose or has become corroded. If everything appears to be normal, the next step will be to see if the fuel injector is operating. With the engine running, listen to the injector to see if it is working. You can usually tell if it is by placing the blade of a long-handled screwdriver against it, placing the handle against your ear, and listening for a rather pronounced clicking sound. If you hear nothing, the injector has either failed, or it is not receiving electrical power. A voltmeter will indicate if power is present. If no voltage is present, the wiring to the fuel pump relay could be at fault. If power is present, check both terminals to see if the PCM injector driver is operating. If it is, the fuel injector needs to be flushed out or replaced. Your local auto parts store will usually have a direct injector flushing kit in stock, or one can purchased online if necessary. If cleaning the injector does not resolve the issue, it will need to be replaced. There is always a possibility that more than one ODB code may be present when the Service Engine light illuminates. Should that be the case, a check should always be made to see if any of the other codes are still present once any code P0264 issues have been resolved. Code P0325 can be set by the knock sensor if it is receiving a low input, or if the sensor itself is malfunctioning. Code P0302 is set when a misfire is detected in the #2 cylinder. Problems other than fuel injector issues will sometimes set this code, but if Code P0264 has also been set, the problem likely involves the fuel injector or its circuitry. Code P0266 indicates the #2 cylinder is experiencing a fuel-related problem (usually referred to as a contribution/balance fault). and as such can assist in the diagnostic exercise. It will be set if the cylinder is contributing less power than the other cylinders (it must be within 5% of the others). Code P0265 is caused by high, rather than low reading of the #2 cylinder fuel injector sensor, and indicates the fuel mixture is too rich. Its symptoms are much the same as the P0264 symptoms, but the cause is usually different. A fuel that is too rich in anhydrous ethanol contains an excess of water vapor that can have an adverse effect on fuel injectors. This tends to be a problem with small engines rather than automotive engines. None found. Ask a question about P0264.